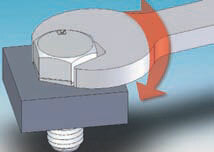 The SBS fastener can be assembled and tightened using a standard wrench or socket. This applies to either type of washer used (hex or round). However, removal of the nut/bolt requires a different approach depending on which type of washer is used. Using the hex washer with the nut/bolt allows the fastening to be loosened using a standard wrench or socket. 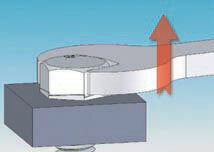 The round washer however cannot easily be loosened using the same standard tools. In this instance the use of a specially designed SBS indexed socket is required. This has the benefit of adding an 'anti-theft' element of this combination of nut/bolt and washer.